Top seeds, Japan’s Honoka Hashimoto and Hitomi Sato won the Women’s Doubles title at the 2017 ITTF Challenge Belgium Open in De Haan on the afternoon of Sunday 4th November; that is the hard fact, a fact that does not reflect what proved a dramatic final. In the title deciding duel, the Japanese duo beat Korean qualifiers Lee Zion and Song Maeum by the minimal two point margin in a full distance five games contest (11-8, 12-10, 6-11, 11-13, 11-9). Lee Zion and Song Maeum, competing in their first ever such final, either together or apart, proved more than worthy opponents for the tournament favourites; they saved no less than three match points before having to concede defeat. They lost the first two games but then became more and more adjusted to the backspin play exercised by the Japanese duo; in fact, as the match progressed it was not the defensive returns of Honoka Hashimoto and Hitomi Sato that caused the Koreans problems, it was the ability to exercise controlled forehand attacking strokes when the chance arose that disturbed the rhythm established. In the third game, the Korean duo established a 6-2 lead, they maintained the advantage to win the game but in the fourth game they trailed 8-10; two match points for Honoka Hashimoto and Hitomi Sato. Focused Lee Zion and Song Maeum won the next three points, the Japanese duo levelled, before the next two points went to Korea. A fourth game beckoned, at the change of ends Lee Zion and Song Maeum led 5-4, they extended the lead to 7-5 but then lost five of the next six points to give Honoka Hashimoto and Hitomi Sato a 10-8 lead. One match was saved but not more, Japan celebrated. Thus for the fifth time Honoka Hashimoto and Hitomi Sato secured an international Women’s Doubles title of note. 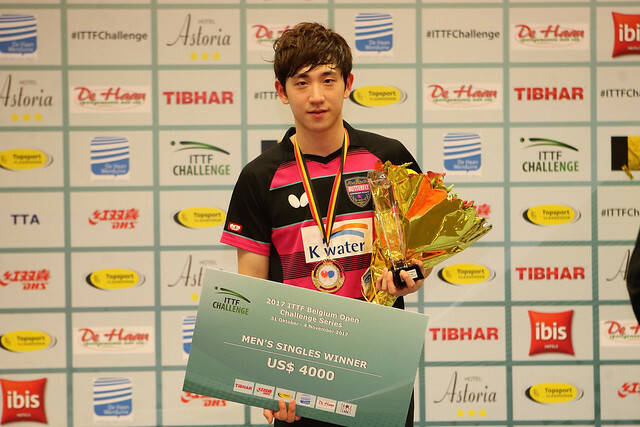 On the ITTF World Tour they won last year in Australia and Austria; earlier this year they once again reached the final in Austria where they finished in runners up spot. Meanwhile, on this year’s Challenge Series, prior to the meeting in De Haan, they had emerged successful in Thailand and Croatia.